Bellow you can find the steps I used to create a OVPN server using a Mikrotik router. In this example we will be using a router with the external IP 192.168.88.2, internal IP 192.168.89.1 and the pool for the OVPN clinets will be 192.168.87.0/24. You will need to run the command bellow one by one, the signing of the certificates will take time and will load the CPU. Note that sometimes you will get an “action timed out” error when you will be signing the certificates, that is not a problem, you just have to wait a little bit longer. 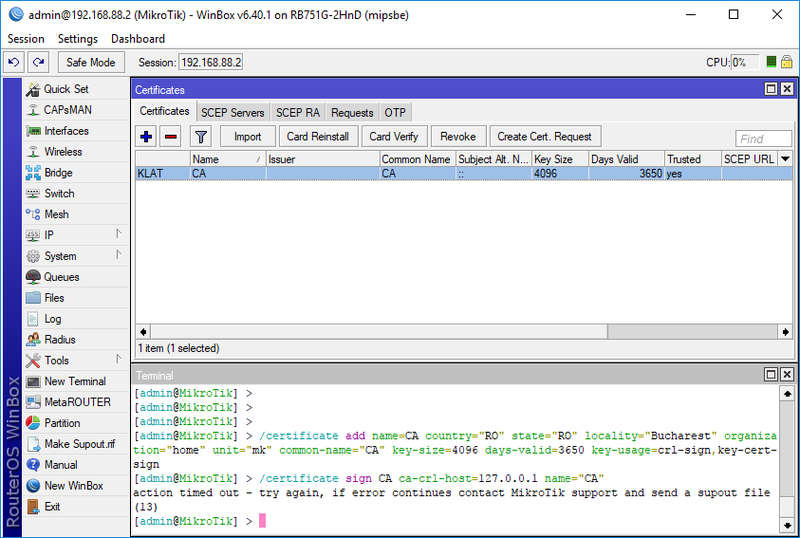 You can see that the router is busy with the certificate sign from the CPU usage, when the certificate is signed the CPU usage will drop and you will see the “KLAT” in the line description of the CA certificate and “KI” at the server and client certificate, after the certificate signing is done you can proceed with the next certificate. /certificate sign CA ca-crl-host=127.0.0.1 name="CA"
/certificate sign server ca="CA" name="server"
/certificate sign client ca="CA" name="client"
/certificate add name=client1 copy-from="client" common-name="client1"
/certificate sign client1 ca="CA" name="client1"
Save the exported files to your PC. 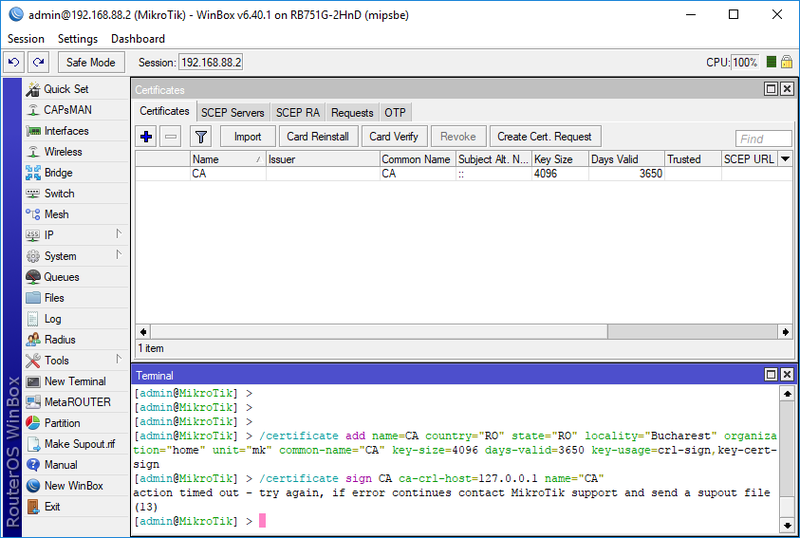 Remove the “cert_export_” from the certificate name, afther that you eill have 3 files: “CA.crt”, “cleint1.crt”, “cleint1.key” “This is not so important but the long file name bothers me”. 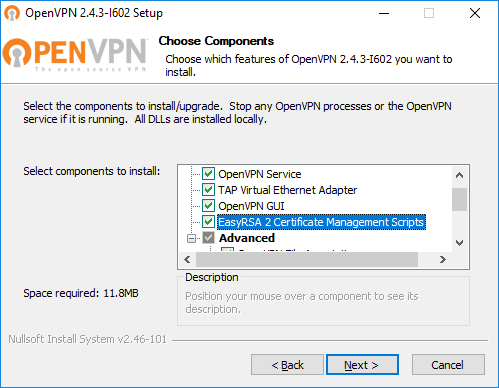 Install OVPN on your PC and make sure you check the “EasyRSA 2 Certificate Management Script”. 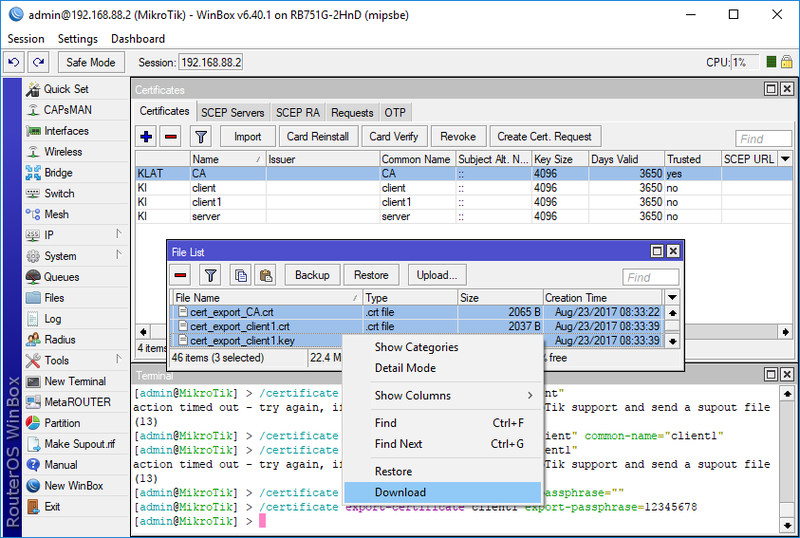 It will ask you to : “Enter pass phrase for client1.key”, you set the pass phrase when you exported the certificates, in this example the pass phrase is: “12345678”. You are all set now and you can connect to your OVPN server. To test the server, in addtition to the certificates and the key, I used the test.ovpn and auth.cfg. Note that Mikrotik does not support UDP and LZO compression. A side advantage of using a VPN is that I’m blocking the ads on my phone by using ad block script on the OVPN server and connecting the phone to VPN. Yes I know, I get the same error on my home and work networks and I haven’t been able to find a solution, but it seems that it doesn’t affect anything so I just ignore it.